The global resources of oil and gas are one of the world’s most valuable commodities and often located in the most inhospitable locations. Typically oil and gas plants are large, sprawling industrial complexes with extensive piping running throughout, carrying streams of fluids/gases between large chemical processing units. With large perimeters these sites present a massive security challenge for their operators. In time of war, civil unrest or peace they have been seen as a target for hostile/terrorist attack with disruption or damage having global effects to world economies and destabilising internal governments. There have been numerous attacks and bombings at oil and gas refineries in the form of hostile vehicle attacks in the Middle East and Africa in the past decade. Avon Barrier manufactures and installs their crash-tested vehicle security barriers (VSB) to mitigate against the threats that vulnerable sites face, ensuring the highest level of perimeter protection. The security objectives are to protect assets and staff from aggressive threats by securing perimeters and keeping unauthorised personnel and vehicles from entering the site. Security consultants are tasked with assessing the sites vulnerabilities, working alongside Avon Barrier’s experienced engineers a holistic solution can be designed to secure a perimeter. By incorporating vehicle exclusion zones, approach speed management, high security fencing/walls and vehicle security barriers (VSB), keeping the access points at a safe distance away from the internal site buildings and critical target areas. Restricting vehicle borne explosives to the perimeter of a site and increasing the ‘stand-off’ distance reduces the potential loss of life and damage of assets to the absolute minimum. 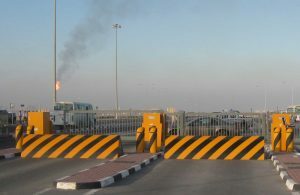 Road blockers are one of the recommended products to protect refineries; they provide a visual and physically aggressive appearance, deterring any potential attacker. Avon Barrier’s RB780CR Chieftain and RB1000CR Centurion crash-tested road blockers (PAS 68 & ASTM 2656-07) along with other blockers in their portfolio are available in a large range of widths, which can secure all types of roadways. Our road blockers, like any of our products, are designed to withstand heavy traffic flows and axle weights and are able to react in an emergency and rise in less than 1 second to secure a site. In the event of power loss a blocker can be fitted with an accumulator to enable manual operation. 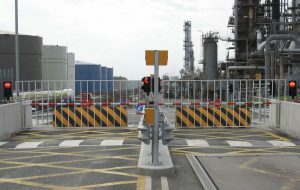 In many cases gates and rising arm barriers and other Avon products will be used in conjunction with road blockers to compliment vehicle/pedestrian access flow and security procedures. With their extensive experience in protecting the Oil and Gas sector around the world Avon Barrier are well placed to offer a professional solution to the needs of the industry.